This is the RollFit Seal Nasal Cushion Replacement to be used with the Eson mask from Fisher & Paykel. The RollFit design actually “rolls” back and forth and actually adjusts on the bridge of the nose automatically. 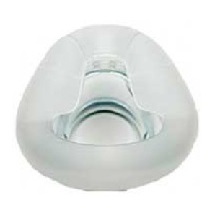 This unique design helps to reduce pressure on the bridge of the nose, which is a common problem with CPAP masks. This feature enhances better fit and seal. These cushions are composed of a silicone seal and an acrylic shell and are not meant to be separated. IT SHOULD BE NOTED: The Easy Frame of the Eson mask can accommodate any size Rollfit Seal Nasal Cushion, so the cushions are interchangeable. If you need a different size, just order the size you think you need and it will fit on the Eson frame. This is the RollFit Seal Nasal Cushion Replacement to be used with the Eson mask from Fisher & Paykel. The RollFit design actually “rolls” back and forth and actually adjusts on the bridge of the nose automatically. I have had a cpap for about 15 years.. a close guess! the Eson mask is the first one that has been totally comfortable. I LOVE IT. It actually fits .. does not go down on my mouth at all, which previous ones sometimes had a tendency to do, even though I was always fitted with size SMALL. This is the best mask ever and I hope it is never replaced. The headgear is also the most comfortable I have ever had. PLEASE KEEP IT! I have no complaints whatsoever about anything connected to the Eson mask!